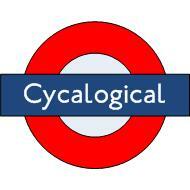 CycaLogical: Dangerous Sport or Mode of Transport? Dangerous sports and activities are pastimes indulged in by people who have the attitude that excitement and achievement are more important than simply living a long but possibly dull life.You know the kind of thing: swimming with sharks, canoeing up the Amazon, lion-taming, climbing frozen waterfalls, off-piste skiing. 1. Participants are very brave, in fact, bordering on the reckless or foolhardy. 2. They know what they are doing. They know the risks. 3. In dangerous sports, it's down to you to look after yourself. If you don't have the necessary level of skill, you shouldn't be doing it. Don't expect anyone to feel sorry for you if you come to grief. 4. You need special clothing and protective equipment. 5. You do it for the thrill. De-risking it will take away the excitement. 6. You cannot take away the risks. The sport is risky by nature. 7. Parents are regarded as irresponsible if they let their children take part. 8. The participants tend to be young men. Regular readers will know already where I'm going with this one. In European cities where cycling is a normal, popular mode of transport, it is as integrated into peoples' everyday lives and it has none of the above characteristics of a dangerous activity. and the authorities have gone to considerable lengths to protect cyclists from hazards. In the UK, cycling by and large has all of the characteristics of a dangerous sport. Even though cyclists face risks that other road users don't, most of the time they are not considered worthy of any special consideration. That's because it's a dangerous sport: you know it's dangerous and it's down to you to look after yourself. Consider the most dangerous junctions in London. Cycling facilities are inadequate at best, and continue through badly-designed and non-existant and terminate at worse-than-useless. The attitude is that cyclists are simply there by choice on roads that are dangerous by nature. Cycling is risky, and just because there's the odd token cycle facility here or there doesn't change that basic principle. Roads exist for motor traffic; if you don't like it then choose a quiet route or better still get a car. Just don't come crying to us when you get run over. Especially if you're not wearing a helmet or a yellow jacket. Boris Johnson's attitude and the Tory attitude in general come from the 'dangerous sport' school of thought. They are happy for people to cycle, as long as they look after themselves and don't expect any special treatment. For Boris, cycling is jolly good fun and he's keen for more people to enjoy it - but it's the attitude of the mountaineer evangelizing about his sport, rather than the attitude of someone formulating transport policy. The 'dangerous sport' approach to cycling is most apparent in how cycling funds are allocated. Training is usually high up the list. Why? Why are cyclists expected to have a higher level of skill than other road users? The answer's pretty obvious: you wouldn't expect to go climbing the Matterhorn if you couldn't use ropes. While it's true that you need to pass a driving test to get behind the wheel of a car, it's clear that this hardly a stern test of your ability or disposition to use the road safely. Traffic engineers are falling over backwards to protect motor vehicle users from themselves, and from others. Pedestrians aren't expected to have any special abilities, and are provided with segregated pavements and crossings. That's because pedestrians and drivers are expected to be just ordinary people with ordinary abilities trying to get around. Cyclists aren't. They are deliberately taking calculated risks, or else being reckless. Rather take responsibility for the external risks of cycling, the authorities want to put the responsibility for risk reduction on the cyclist, in a way they don't with pedestrians or motorists. Look at the discussions around the recent M5 pile-up, which was much less about drivers going too fast for conditions and failing to react to hazards, and much more about blaming external factors such as a nearby fireworks display or the weather. Contrast that with the victim-blaming that often accompanies reports on cycling fatalities. Then the questions are: what was she doing on the inside of an HGV? Was she wearing a helmet? Would better training prevent this from happening? And even when the cyclist has done nothing wrong, the death is often described as an unavoidable accident. The unstated assumption underlying all of these attitudes is that cycling is inherently risky, so accidents happen if you are irresponsible, or even if you're not. It's got to be said that vehicular cycling campaigners aren't doing much to convert cycling from a dangerous sport into a trasport mode. Their attitude tends to be one of risk-denial (it's not statistically that dangerous and the benefits outweigh the risks), or risk management (the Cyclecraft view that by cycling skillfully and integrating with traffic you can stay safe). That approach is fine for people who want to cycle in today's road conditions, but it cements the idea that as a cyclist, risk is your problem and not the responsibility of traffic engineers. Another vehicular cycling argument is that better enforcement of traffic law would fix the problem. This implies again that there's nothing systemically wrong - it's just a few bad drivers causing the risk. Cycle campaigners, traffic engineers and transport policymakers need to accept that cyclists are not the problem. And indeed motorists are not particularly the problem. It's the infrastructure, stupid. Everyone is behaving pretty much exactly as they do everywhere else in the world, and the results are exactly as you would predict. Motorists with average skills, sometimes in a hurry, sometimes impaired or distracted, sometimes reckless, and cyclists with average skills, sometimes in a hurry (but a lot slower), sometimes impaired or distracted, sometimes reckless: put the two together and see if you can figure out who comes out worse. It's hardly rocket science. So if cyclists and motorists aren't the problem, what is? In any other situation involving systemic risk, there's a lot of effort made to reduce it. At a ski resort, the beginners are on the nursery slopes, the experts are on the black runs. At the zoo, the penguins aren't in with the lions. But on UK roads, there's little or no risk reduction for cyclists, especially at the most dangerous junctions where it's most needed. At work there's a whole raft of health-and-safety legislation to protect you. If you take a train or a plane, you can relax in the knowledge that there are multiple expensive fail-safe systems in place for your protection. In a car you have more airbags than you can shake a stick at, and armco barriers to gently guide you away from the trees should your concentration wander. Why then nothing for cyclists? Is it because they like risk? That's why the public think cycling is risky, and it's only when the authorities address the lack of consistent, continuous and visible commitment to safety that cycling will lose the status of a dangerous sport. Actually, Rock Climbing and Alpine mountaineering are all about risk management. You can pretty much eliminate all risk from basic rock climbing on quality rock -climbing grades actually take the risk factor into account as well as technical difficulty. Similarly mountain biking. You, friction, gravity, trees. All generally predictable, and you are in control of all decisions -hence all outcomes. You cannot eliminate risk from navigating a three lane roundabout as you are vulnerable to any mistake a driver does. This actually raises it more to the mountaineering level, where you have "objective hazards" (avalanches, rockfall, serac collapse, snowbridge failure) alongside the subjective hazards (taking the wrong map, not bringing enough water, etc). The Cycle campaigners, traffic engineers & transport policymakers require to accept that cyclists are not the issue.